Aldington, christened Edward Godfree, was born at Portsmouth, Hampshire, England, on July 8, 1892. At an early age, he moved with his mother, Jesse May, and father, middle-class lawer Albert Edward Aldington, to Dover. There he grew up with his sister Margery and attended preparatory schools, after which he studied for four years at Dover College. It was at Dover, also, that he began collecting butterflies--an occasional hobby that he would stay with for most of his life. When he was sixteen, the family moved inland to Harrow, and then to Teddington. There, Richard (he chose to be called Richard while still a boy) enrolled in University College. He did not much enjoy the academic standards there, however. This was probably due to his having gotten used to the informal, eclectic education he provided himself in his father's excellent library, and studying with his older friend Dudley Grey who was a classical scholar and world traveler. In any case, he did not complete his education at University College due to a sudden financial loss suffered by his father, that forced him to withdraw. In later years, even though he tried to down-play the importance of the degree he never got, Aldington was often defensive about lacking that degree. For a while, Aldington was supporting himself with odd jobs, mainly as an assistant to a newspaper sportswriter. Finding this less than fulfilling, he decided he could get by with a more Spartan lifestyle and devote more of his time to writing (and occasionally selling) his poetry. He was soon invited by Brigit Patmore to a party where he met such members of London's literary avant-garde as Ford Madox Ford (actually Ford Madox Hueffer, at that time), Harold Monro, W.B. Yeats, and Ezra Pound. After befriending Aldington, Pound soon introduced him to his American friend, H.D. (Hilda Doolittle). Aldington and H.D. were quickly attracted to each other and found that they had much in common--namely an ardent love of classical Greece and its literature. With a little financial help from his parents, Aldington was able to go to Paris for a few months in 1912. "Ezra and H.D. were there," he wrote, "so I didn't lack the companionship." He fell in love with Paris, wrote a few poems, and translated a few works. Aldington then returned to London, but only for a short time before setting off on his first trip to Italy which lasted seven months. He was with H.D. at this time and remembered it in later years as "the good time." By the time he got back to London in the summer of 1913, Pound was already working on the first anthology of Imagist poetry, Des Imagistes. Aldington and H.D. were married on October 18, 1913. H.D. and Pound had been romantically involved before she married Aldington, and her attraction to Pound may not have entirely disappeared after the marriage. Their marriage was a reasonably happy one for a short while, but came upon particularly hard times after their first and only child was stillborn on May 21, 1915. This event had a marked effect on H.D. 's writing and mental well-being, and was no doubt a key factor in the couple's decision in 1919 to live apart from one another. They lived separately for many years, and finalized their divorce on June 22, 1938. They became close again in their later years. There is one lover I await above all. Reprinted with the kind permission of Catherine Aldington. The 1920's and 30's were a time of great advancement for Aldington's career as writer and critic. He enjoyed an influential friendship with T.S. Eliot, who took over editorship of the literary journal, the Egoist, from Aldington in 1917. He published 24 books, as editor or translator, or collections of his poems, between 1920 and 1929, including the first book of his about his friend D.H. Lawrence, D.H. Lawrence, An Indiscretion. Over the following ten years, he published several more collections of short stories, three long poems, four editions of his collected poems, miscellaneous literary journalism and wrote seven novels. He published his last novel, The Romance of Casanova: A Novel, in 1946. Aldington traveled to the United States in 1935 and rented a house on the Connecticut River at Old Lyme. He lived there off and on for ten years. In 1937 he fell in love with the daughter-in- law of his old friend Brigit Patmore. Netta (at the time, Mrs. Michael Patmore) traveled with Aldington to Italy in April, and the two stayed there until October. While in Italy, Aldington finished his last important poem, The Crystal World, and was working on a novel, probably Seven Against Reeves. After Netta obtained her divorce from Michael, and Aldington finalized his divorce with H.D., the two were wed in London on June 25, 1938. Their daughter, Catherine, was born shortly afterwards, and by September they were back in France where they stayed until February, 1939. In New York, in 1939, Viking had published Aldington's novel Rejected Guest, then offered him editorship of The Viking Book of Poetry of the English Speaking World. Back in Connecticut, Aldington sold serial rights to his memoirs to the Atlantic Monthly which were published in 1941 by Viking under the title Life for Life's Sake. He had been deeply disturbed by the First World War, and after the start of the Second, he felt that the Europe he had known was no longer there for him. His memoirs contained what he then felt was his farewell to his prewar Europe. After the Aldingtons had moved to Florida, Richard began working on his biography of the Duke of Wellington (published in 1943). This marked the beginning of his rather significant career as a biographer over the next ten years. In 1942, recalling the sale of the film rights to All Men Are Enemies ten years earlier, Aldington took his family to Hollywood where he hoped to work as a screen writer. They stayed in Hollywood for over three years while Richard worked as a freelance writer for the studios. He also finished The Duke, which he began in Florida, edited the Portable Oscar Wilde, and did a few translations. In 1954, income from the royalties from his numerous works diminished considerably with the publication of Aldington's biography of legendarily heroic Lawrence of Arabia. Lawrence L'Imposteur: T.E. Lawrence, the Legend and the Man, was published first in Paris, then a year later in London under the title, Lawrence of Arabia: A Biographical Inquiry. Aldington expected that he would be writing the biography of a hero, but in the process realized that the legend of the man was, in fact, legend indeed--and mostly of T.E. Lawrence's own making. Even though in later years, most historians came to agree with Aldington's account of the facts of Lawrence's life, the general public in 1955 was not ready to accept it. The abuse aimed at Aldington from his critics was overwhelming and resulted in publishers refusing to print his works and bookstores refusing to stock them for lack of demand. After 1957 the public's poor opinion of Aldington subsided somewhat, and his works went back into print and he was given more editing work. Several of his works were translated into Russian and he found himself quite surprised by his popularity in the Soviet Union. In February of 1962, he received an invitation from Alexei Surkov, Secretary of the Soviet Writers Union, to visit the USSR for the celebration of his seventieth birthday. Aldington looked forward to having the opportunity to flaunt his acceptance among his Russian readers to his fellow British intellectuals for whom he felt quite a bit of disdain. 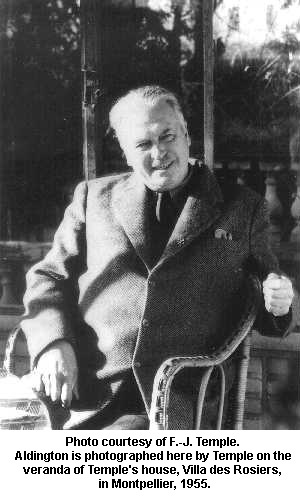 Before his death in 1962, in a letter to Eric Warman in May of that year, Aldington writes that with his trip to Leningrad and Moscow, "I shall at least have the pleasure of annoying some people in G[reat] B[ritain]." Aldington was asked to give a speech to the Writer's Club in Moscow during the celebration of his 70th birthday. Mikhail Urnov recalled Aldington's words, "Here, in the Soviet Union, for the first time in my life I have met with extraordinary warmth and attention. This is the happiest day of my life. I shall never forget it."